We design and manufacture a variety of plastic containers - and some of them are for nonfood items. We have come out with a very sensible range of Round Dishwash Bar Containers made from 100% nontoxic plastic. This range as the name suggests is ideal for keeping dish washing soap. We offer the range in standard and customized designs where in the client can suggest a logo of his choice. The range comes in transparent white and also in colors. 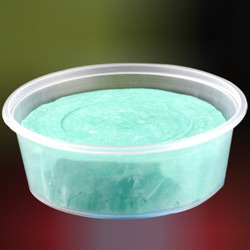 The round dishwash bar containers have variable filling capacity. Looking for Round Dishwash Bar Containers ?